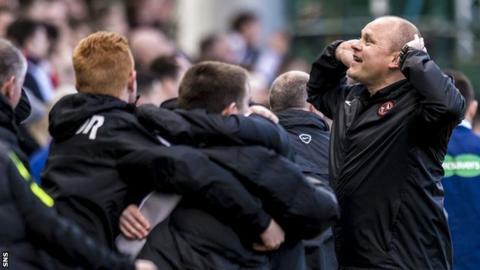 Dundee United manager Mixu Paatelainen has been called to a Scottish Football Association disciplinary hearing for allegedly "shouting and gesticulating" at Dundee fans at Tannadice on Sunday. The Finn has until Friday 1 April to respond and a disciplinary hearing has been set for Wednesday 13 April. St Mirren manager Alex Rae, meanwhile, has been "offered" a one-match ban. He is alleged to have used "offensive, abusing or insulting language to the referee" in a game against Raith. The Buddies boss has until Wednesday 30 March to accept the ban or Friday 1 April to notify the SFA that he will contest it. As with Paatelainen, the principal hearing is set for 13 April. After seeing his side fight back from 2-0 down to draw 2-2 in the derby, Paatelainen said the Dundee fans "were giving me plenty of pelters throughout the game". "When we scored, they were very quiet and I couldn't hear anything so that's why I was like, 'where are you, have you gone away?'" he explained. "I gave them a little wave afterwards, that's the way it goes."